Below, we’ve expanded on helpful information that will allow you to make the best decision to determine if polarized sunglasses are for you! Well, they are sunglasses with a special chemical film that coats the lens which helps reduce glare. With this chemical film on polarized sunglasses, you are able to see more clearly. In addition to being able to reduce harmful effects from UV light. Polarization blocks glare because glare isn’t ideal when you’re having a stroll out in the park. Glare is caused when the sun’s rays reflect light in every direction and when a ray hits a flat surface and reflected light shines back at your eye. This is where polarization comes in to eliminate it. When wearing sunglasses without polarization, the lenses only reduce the amount of light that is transmitted through the lens both horizontally and vertically. If you choose polarized lenses, though, the glasses absorb horizontal light waves, while still allowing vertical waves to pass through. Basically light only travels in one direction through polarized lenses which then eliminates glare. What are the benefits of Polarisation? There are 3 main benefits to having a pair of polarized sunglasses, reduce glare (which improves safety), reduce eyestrain, and better vision. First, reducing the glare improves your safety and experience overall. 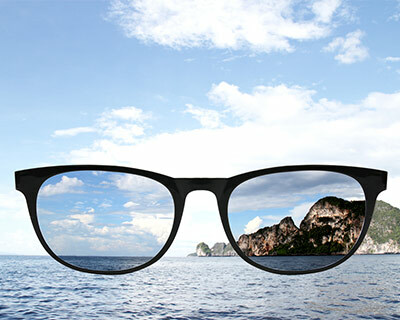 A polarized lens removes the effects of glare by blocking reflections. This improves roadways and water sources safety as the major culprit is glare, and can cause danger to drivers who may already struggle with vision issues. Next, eyestrain is a nasty side effect of glare which can be relieved with polarized lens wear. Squinting to see clear images stresses the eyes and creates uncomfortable eye health issues like redness, irritation, fatigue, and headaches. Polarized lenses neutralize this issue and allow eyes to feel more comfortable and well rested. Finally, Wearing polarized lenses can reveal colors and images like never before. You will see crisply and cleanly, with a level of detail that may astound you.